Totally an Awesome bread, just slightly sweet. Thank you Aparna! History and origin may call this an Easter bread but I say it’s nice just about anytime. It makes terrific toast with tea or coffee, morning, noon or night. I got a nice oven rise with this but with all bread flour I think it might have been truly huge and so … as Aparna did, placing a ramikin or ring in the middle might be a good idea to keep a hole open in the middle of the ring. Aparna saw no reason to toast the almonds before baking and neither did I: this is baked with the almonds on top at 400°…how are they not going to toast? As Karen said, watch this and cover with foil so that it doesn’t get too dark. 1. Mix the flour, yeast, salt, sugar, and lemon zest in a large bowl. Make a well in the center of the mixture and add the butter, eggs, and milk. I’m trying to use up what is on hand and only had 1/2 the bread flour called for so used AP. 2. Mix in the flour from the sides of the well. Add the water 1 tablespoon at a time, as needed, to form a soft, sticky dough. I used all the water called for. 3. Turn the dough out onto a lightly floured work surface. Knead until smooth, springy, and elastic, about 10 minutes. 4. Put the dough in a clean bowl and cover with a dish towel. Let the dough rise until doubled in size, about 4 hours. Punch down the dough, then let rest, covered with a dish towel, for about 10 minutes. 5. Divide the dough into two equal pieces and roll each piece into a 16-inch-long rope. Twist the two dough ropes together. 6. Place the dough rope on a buttered baking sheet. As you might see here, I used a skillet. Shape it into a ring by bringing the two ends of the rope together. Pinch them to seal and cover with a dish towel. Proof until doubled in size, about 11 ⁄2 hours. 7. To make the topping mix the cinnamon, sugar, almonds, and egg yolk in a bowl. I used my hands to spread the mixture as evenly as possible over the top of the ring. 8. Bake at 200C (400F) in the preheated oven for 45 minutes, until golden -cover with foil to prevent it getting to dark- and hollow sounding when tapped underneath. Cool on a wire rack. We would love for you to try out this recipe and join in as a buddy baker this month! This is a wonderful bread to quickly bake. You don’t have to have a blog to participate, a picture will do. Just send a picture or your post of your finished bread to comments my kitchen at mac dot com, along with a photo and your baking experience by April. 30 and be sure to put BBBuddy in the subject line. You will receive a Bread Baking Buddy graphic to keep or add to your post, and be included in our Buddy round up at the end of the month. New recipes are posted every month on the 16th. Check out our Facebook group to see the participants’ baking results during that time. Categories: Bread, Bread Baking Babes, Coffee Cake, Sweet | Tags: BBB, Bread, breakfast, Brunch, Coffee Cake | Permalink. Just drop dead simple/easy and oh my so very good. Our kitchen of the month is Kelly from A Messy Kitchen who found the recipe in the New Artisan Bread in Five Minutes a Day … and then further adapted by me because I always just can never leave well enough alone. I topped my loaf with extra anise seeds and some black sesame seeds and totally poked it full of holes; when I took it out of the oven, I brushed the top with a little butter … yes really I did because it just is such a beautiful smile that way. As simple as this is, it is gorgeous baking, wonderful warm and cooled, toasts like a dream, delish plain and lovely with butter or a touch of jam, great to sop up broth based soups, really any soup or stew. This is definitely in the keeper file. Thank you much Kelly. Mix flour, water, yeast to combine. Cover and left out on counter 6 hours. Mix together the yeast, salt, anise and water in a large bowl or container. Stir in the remaining ingredients and all of the something of a starter with a large wooden spoon, dough whisk, or in a mixer with the paddle. Mix until the flour is incorporated fully. Cover and rest until the dough has fully risen and collapsed back down a bit, about 2 hours. Mine then went into the refrigerator overnight. You may use the dough after the initial rise but it’s easier to work with cold. Dough will keep up to 10 days in the fridge. Divide the dough in half, dust with flour, and shape each portion into a ball by stretching the sides down to the bottom of the ball and folding under. You may also work with only one portion of dough if you like, the other will keep in the fridge for another day. I shaped only one loaf; returned the remaining half of the dough to refrigerator. Flatten the dough ball into a ¾” thick round and let rest covered on a parchment lined or cornmeal dusted pizza peel for 20-30 minutes. Optional to brush the surface with oil and sprinkle with sesame seeds or more anise seed. Also optional to poke the dough with a skewer in a few places prior to baking. Slide rested loaf directly onto hot stone. I baked my round loaf in the pre-heated lid of a cast iron dutch oven; worked perfectly. Pour 1 cup of hot water into the metal pan or tray for steam and quickly close the oven door. Bake for about 20-25 minutes until richly browned and firm. Baked for 30 minutes. Considering all the whole grains in this, I will allow 35 minutes for the next bake. Seriously, after you read Kelly’s post and catch the waffle recipe I don’t really think you can stop yourself baking this bread! We would love for you to try out this recipe and join in as a buddy baker this month! This is a wonderful bread to quickly bake up to go with any meal. You don’t have to have a blog to participate, a picture will do. Just send a picture or your post of your finished flatbread to Kelly at eleyana (AT) aol (DOT) com, along with a photo and your baking experience by Mar. 31st and be sure to put BBBuddy in the subject line. You will receive a Bread Baking Buddy graphic to keep or add to your post, and be included in our Buddy round up at the end of the month. New recipes are posted every month on the 16th. Check out our Facebook group to see the participants’ baking results during that time. Categories: Bread, Bread Baking Babes, Flat Bread | Tags: barley, BBB, Bread, dinner, grain, Whole grains, whole wheat flour | Permalink. I can’t imagine where eleven years have come and gone baking bread after bread with Babes. Somehow, here we are on our eleventh anniversary. Simple, complex, straight or sour dough, I never tire of flour and yeast. I never seem to see a bread coming either. Although there are breads I have sort of in a reserve place that I think the Babes must bake one day. One that comes to mind is salt rising bread. I’ve tired it twice and it’s good but not for the faint of heart. Recently I got hooked on The Great British Baking Show. Obsession doesn’t come close to how much I was watching. And when it came to the breads, I watched many of them over again immediately. In late December, I watched one where they baked Chelsea Bun Christmas Trees. It some how caught me that the bread and the bun were basic but the shape and the filling should be the challenge that suited a February Valentine. I had some really fancy ideas in the beginning but when it came to execution, simple took over and Gorn was won with a very simple heart … I think it had something to do with the some what cherry pie like filling I came up with. Cherries will win him over any day, even in a bun. Ordinarily I would have added walnuts to buns but I was with grandkids and was told they wouldn’t eat them. Pour into the flour mixture, add the eggs and stir thoroughly until the contents of the bowl come together as a soft dough. The dough will be sticky. Tip the dough onto a lightly floured work surface and knead well for 5 minutes, until the dough is smooth and elastic. Alternatively this can be done in a stand mixer using a dough hook. I found this to be an easy dough to do by hand. Place the dough into an oiled bowl and leave to rise, covered with a shower cap, for one hour or until doubled in size. Mix the filling. I used a cherry preserve that was cherry pie like filling and added some dried cherries to that. I also sprinkled my dough with some brown sugar for that extra. Tip the dough out onto a lightly floured work surface. Roll out dough into a rectangle about 20in x 14in. Tack down the long side of the dough rectangle nearest to you by pressing it down onto the work surface with your thumb. Brush all over with the melted butter. Then spread the your filling over the dough leaving a 2cm boarder. Roll the opposite long side of the dough towards you quite tightly, until the roll is complete and tight. Trim the ends to neaten. With a sharp knife cut into 15 thick rounds – about 1.5in. Line a very large baking tray or use the grill tray from your oven with baking parchment. Arrange rolls on the prepared tray, cut side up, in heart shape: I just drew a heart on parchment paper and filled it in. You want the buns to be close enough so that when they rise further and then bake; they will bake with their sides touching. They can then be pulled apart and you get a lovely soft edge. Cover loosely and let rise for 30 – 45 minutes. When the buns are ready, put them in the oven and bake for 20-25 minutes until golden-brown. Check after 15 minutes or so and cover the buns with foil if they are getting too brown. Mine needed no foil. Melt the additional preserves in a small saucepan with a splash of water until smooth. Brush the jam over the buns to glaze and allow to cool. It’s sort of a heart … it went fast enough that the shape didn’t really matter. Valentine’s Day maybe over but there’s always desire for sweet hearts and bread. Be a buddy, bake a heart overflowing with love, we’d love to see what you’d fill your heart with on top of all that love. I know the Babes will change things up, so don’t miss all their hearts. Send me your post with photo before February 28, I’ll do a round-up post and add you in as well as send you a cool Buddy badge. Categories: Bread, Bread Baking Babes, Rolls | Tags: BBB, Bread, breakfast, Brunch, white whole wheat flour, Whole grains | Permalink. Before I tell you how much I messed this bread, let me tell you why I will be baking this bread all summer long when tomatoes are in season. This has got to be incredible bread with the likes of Black Beauty Tomatoes and the like that’s why Vivian Howard named it Elbow Lick Sandwich. Below you’ll see how I caramelize onions in the crockpot whenever I need them. I made this bread toward the end of November in Michigan when the temperatures were freezing at night … My current understanding of what happened is that set on LOW outside where the temperature dropped to 33, the crockpot overheated attempting to compensate and my onions were burned black by morning. Onions outside in the crockpot on LOW during daytime temperatures in the mid 40s did just fine. Really, I’ve never ‘burned’ anything in the crockpot till then. Elizabeth is to thank for bringing this bread to our table. This has been a really really fun learning experience bread with lots of back and forth between BBBs. To say we loved this bread is an understatement. I baked this bread twice as a long thinner than usual loaf. The second time measurements were basically the same adding about 1/4 cup extra flour both times. The biggest difference was the second time I allowed for extra rising time at all stages and baked it for 20 minutes longer. I believe the excess moisture was due to the thickness of the loaf shape. This summer when I bake this as a round with a hole in the middle, thinner and flatter, I think this will be spectacular. 1. EVENING OF THE DAY BEFORE MAKING THE BREAD: Put the starter (or active dry yeast, if you’re using that) and water into a smallish bowl. Mix with a wooden spoon. Use the wooden spoon to stir the flour in well. Cover the bowl with a plate and set aside overnight in the oven with only the light turned on. This is the leavener. EVENING OF THE DAY BEFORE MAKING THE BREAD: Preheat oven to 400F. Cut the ends off of the sweet potato and place it whole on a baking sheet lined with parchment paper. Bake until tender. This should take about 45 minutes. Vivian Howard wrote the following: Once you start to smell them, probably after about 45 minutes, give the potatoes a look. My mom always looked for a little of their juice to have leached out and caramelized, but that is more romantic than necessary. When the potatoes are done, their skins should have separated slightly from their flesh and they should pierce easily with a knife or fork. 3. EVENING OF THE DAY BEFORE MAKING THE BREAD: Heat oil for onions in a cast iron pan. Add the onions and salt and caramelize the onions over medium heat until they are golden brown. Vivian Howard says this will take 30-40 minutes. Set aside in a cool place until the next morning. ***Alternate method I used: Once upon a time, I made Thomas Keller’s French Onion Soup … WOW! I actually followed his heating directions and stood at the stove top stirring and watching like a hawk for hours, really hours. That soup was good, far surpassing anything I’d ever had. No, I’ll never do that again. Now, my go to method is to caramelize onions in the crockpot. It seems I’ve always done this in the summer time and because Gorn hates the smell, I put them outside on a porch. It works like a charm. Cook on LOW 10-11 hours. Stir, leave lid ajar to allow evaporation of liquid and continue on LOW 3-5 hours depending on how dark you want them. Put flour, wheat germ, all but 18ml water, leavener, honey, sweet potato puree into a large mixing bowl. Use a wooden spoon or dough whisk to mix these ingredients to make a rough dough. Cover the bowl with a plate and leave on the counter for about 40 minutes. adding the salt: In a small bowl, whisk the salt into the final 18gm (18 ml) water. Pour the salt mixture over the dough. kneading: Use one of your hands to squoosh the salt and water into the dough; use the other hand to steady the bowl – this way you always have a clean hand. At first the dough might be a bit messy and seem like it’s coming apart. Persevere. Suddenly, it will seem more like dough than a horrible separated glop. Keep folding it over onto itself until it is relatively smooth. Cover with a plate and leave to rest for about 20 minutes. stretching and folding the dough and adding the onions. Put a quarter of onions on top of the dough and turn it by folding the dough into the center. Let sit 20 minutes. Repeat at 20 minute intervals until all the onions are in the dough. You’ll notice that after each time, the dough will feel significantly smoother. Cover with a plate and leave on the counter (or if the kitchen is cool like ours in winter and early spring, into the oven with only the light turned on). Once all the onions are added, leave the covered bowl in the oven – with only the light turned on – for a couple of hours to allow the dough to double. (A good way to tell if the dough is reading to shape is to run your index finger under water, then poke a hole in the center of the dough. If the hole disappears immediately, the dough still need to rise. If there is a slight whooshing sound and the hole remains in place, the dough has probably over-risen. If the hole very very gradually begins to close, the dough is ready to shape. prepare the brot-form: Put rice flour into a brotform and distribute it as evenly as possible. (If you don’t have a brot-form, you can line a bowl, basket or sieve with parchment paper. You can also use a liberally rice floured tea towel (but then you have to deal with a floured tea towel once the bread is baked). If you do not have rice flour, you can use any other kind of flour. Note that higher gluten level make it significantly more difficult for the bread to be released from the basket…. pre-shaping: Scatter a dusting of wheat flour on the board and gently place the dough on the flour. Using wet hands, stretch the dough into a longish rectangle, then fold it like a letter, gently patting off any extra flour that might be there. Continue folding until the dough is shaped in a ball. Cover with a clean tea towel and let the ball rest for about 20 minutes. shaping: Without breaking the skin, tighten the ball further. Place it seam side UP in the well floured (rice) brot-form. Sprinkle the reserved bran evenly over the top of the bread. Loosely wrap the shaped loaf with a clean tea towel and enclose the whole thing inside a plastic bag and leave it in the oven with only the light turned on for 3 or 4 hours (until it has about doubled and there are bubbles). Yes, you want to bake this bread! 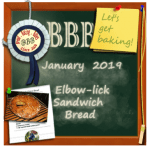 Check out Elizabeth’s post and all the BBB’s who baked this one. It’s a learning experience and such great bread. If you don’t have a blog or flickr-like account, no problem; we still want to see and hear about your bread! Please email me with the details, so your walnut bread can be included in the roundup too. Categories: Bread, Bread Baking Babes | Tags: BBB, Bread, Brunch, vegetable, Whole grains, whole wheat flour | Permalink. These were fun and easy to put together. We enjoyed them, friends thought they were excellent. The sugar is perfect in these, not over the top sweet but still a treat. The spice is perfect and the cherries were excellent. The grandkids would think these were fabulous and they could participate. For my part, this is not the way I would want to use my sugar calories so I probably won’t make them again. Besides, since I grew up with my Dad’s fresh fried yeast doughnuts, not much else comes even remotely close. I am glad to have baked them so I thank you Pat. 1. In a medium bowl, cover currants – or diced dried fruit of your choice – with hot water and let stand until softened, 20 minutes. 2. Meanwhile, in a small bowl, stir yeast with 2 tablespoons warm water and a pinch of sugar and let stand until foamy, 5 minutes. I have not done this for years. I simply add the yeast to the flour and the liquid all at once. 3. In bowl of a stand mixer fitted with dough hook, combine flour, nutmeg, and cinnamon with 1/4 cup of sugar. Add milk, egg, egg yolk and half of softened butter; beat at low speed for 3 minutes. Beat in yeast mixture, then add salt. Beat dough at medium speed until soft and silky, about 8 minutes; the dough should pull cleanly away from bowl. My KitchenAid mixer is still packed and I believe in the shed. I didn’t really have any problem mixing this by hand. I did add extra flour before it became a silken dough. 4. With machine on, add remaining softened butter to dough in walnut-sized lumps, beating at low speed between additions until incorporated. 5. Drain Michigan dried cherries in my case, pressing out any excess water. Add to dough and beat in at low speed. 6. Transfer dough to a greased bowl, turn to coat dough with grease. Cover and let stand in a warm place until doubled in bulk, 1 hour. Punch dough down, form into a ball, and return to bowl. Cover and let stand until billowy, 1 hour. 7. Grease two large baking sheets. (Or line with parchment or foil.) Turn dough out onto lightly floured work surface & cut it into 12 equal pieces. Pinch each piece into a ball and arrange six balls on each prepared baking sheet, smooth side up. Cover with plastic wrap and let stand for 10 minutes. 8. Using lightly floured hands, press each ball into a flat 4-inch disc. Using a 1 1/4-inch round cutter stamp out center of each disc. Return holes to baking sheets. There will be six donuts and six donut holes on each sheet. Cover loosely with plastic wrap and let stand for 1 hour, until risen slightly. 9. Preheat oven to 400 degrees F. Position racks in upper and lower thirds. Bake donuts and holes for 25 minutes, shifting pans from top to bottom and front to back halfway through baking time. Donuts are done when they are golden and puffy and when the internal temperature at thickest part registers 200 degrees F.
10. Spread sugar in a shallow bowl. Brush hot donuts and holes on both sides with melted butter and dredge them in sugar. Transfer to a serving dish and serve at once. And yes I used the crunchy sparkling sugar! that is worth the WOW. Hope that you enjoy these between now and December 29th…which will get here sooner than you think. If you do, send Pat an email at plachman at sonic dot net along with a photo and your baking experience and she’ll include you in the Buddy post, plus send you a gorgeous Buddy Badge designed by Elizabeth. Categories: Bread, Bread Baking Babes, Sweet | Tags: BBB, Bread, breakfast, Brunch, dessert | Permalink. I am once again bowled over! Once again I am humbled. Steamed bread just never seemed very appealing. These were ridiculously easy and good. I went super simple with the dinner plan, BBQ poached chicken: brown the chicken (pound of thighs, pound of breast), poach in chicken broth and Stubb’s BBQ sauce, remove chicken pieces, boiled liquid to thicken slightly, shred chicken, return to the sauce. WOW these were great. Gorn kept thanking me for a wonderful dinner. Disregarding all guidance, Gorn split these and toasted several to enjoy with eggs for breakfast. Good all over again! Thank you Karen! Below are my changes to Karen’s recipe. Check out Karen’s site Karen’s Kitchen Stories for her details, links to World Bread Day and all the other Babes Buns for all our craziness. Rising! Oh the promise of bread. Whisk together the flour, baking powder, sugar, and yeast in the bowl of a stand mixer. Add the water, and mix with spoon. Add the oil, and knead until smooth. The dough should not stick to the sides of the bowl. I did this easily by hand. Cover with a damp towel or plastic wrap, and let rise until doubled (30 minutes to 2 hours). I lined the bottom of steamer with lettuce leaves (the purpose is to keep the buns from sticking to the steamer). Deflate the dough and divide it into 10 equal pieces (mine were about 45 to 48 grams each). Give each piece a quick knead. On a floured surface roll the dough out into a 3 inch by 6 inch rectangle with rounded edges. Fold the dough in half lengthwise, and place on a parchment square. Cover lightly with oiled plastic wrap or a damp towel, and repeat with the rest of the dough pieces. Let proof for 30 to 45 minutes, until slightly puffy. Bring a pot or wok of water to a steady boil (just slightly more than simmering) and fit your pan or wok with a steamer, bamboo basket, or steaming rack just above the water. Place the baos in the steamer, cover, and steam for 12 minutes. Cool slightly, fill with a filling of your choice, and eat. You can refrigerate or freeze (I prefer freezing) leftovers. You can either thaw and re steam for 3 minutes, or wrap one in a damp paper towel and microwave for 20 to 30 seconds. Or split and toast as Gorn did. These go in the easy to do file! Categories: Bread, Bread Baking Babes, Rolls, World Bread Day | Tags: BBB, Bread, Buns, grain, Whole grains | Permalink.